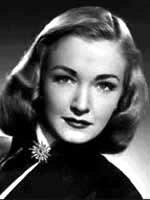 Nina Foch was "a tall, cool drink of water" in several 1940s B movies. Miss Foch had a career as an acting teacher with such students as John Ritter.Her last years she played Mrs Mallard on NCIS. She had a supporting role in "An American in Paris" - don't forget that.